Let’s get right to it: The superfight as we know it between Manny Pacquiao and Floyd Mayweather Jr. is, well, not as super as it was prior to Pacquiao’s lackluster performance on Saturday night against Juan Manuel Marquez. Aside from stylistic problems Marquez posed to Manny, the younger, faster, more complete fighter in his now natural weight class should have separated himself from his nemesis: he didn’t. In fact as the commentators of the fight and others pointed out, he looked confused and defeated, and if scoring was based on countenance, Pacquiao would have lost. Instead, and despite Pacquiao’s majority decision, the fans lost out on the magnitude of the Mayweather/Pacquiao fight, a once in a generation chance to see the best of the best in top form square off to make history. It was the kind of fight that would transcended boxing, one in which an individual could escape from the realities of life and dismal circumstances living vicariously through two combatants, not unlike Joe Louis or James Braddock fights during the tumultuous depression of the 1930’s. And now we are only left to ponder what could have been regardless of the possibility of the fight taking place. 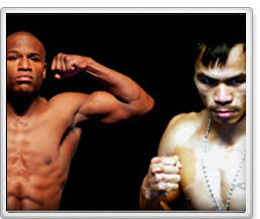 The anticipation, the back and forth about who would emerge victorious, the pay-per view parties; yeah the hype will still be there just lessoned considerably, and some fans may be potentially watching this fight wondering how they will pay their bills void of the trance-like state that is now as gone as Pacquiao’s invincibility. Floyd is as much to blame as anyone. While Pacquiao’s vulnerability Saturday night may lure Floyd into serious negotiations, he could have at any point in the last two and a half years taken this fight and minimized the risk that he or Pacquiao would lose, look bad, or win unconvincingly en route to fighting each other. Now “Money Mayweather’s” bad calculation is going to end up costing him money and minimizing any victory he may have over Pacquiao. Perhaps the old adage “the biggest risk in life is not taking any” rings accurate here for Mayweather. Maybe it was only a matter of time until one of boxing two biggest stars and best fighters looked average. In any other situation, a boxer can have an off night like any athlete in any other sport, but in this instance the stakes for a Floyd/Manny showdown were too high and the margin for error slim to non-existent. One could now make a credible argument that perhaps it should be Pacquiao that stalls fighting Mayweather and take another bout first to restore his confidence and get the bad taste of Marquez out of his mouth. Yet such a bout would probably come against Timmy Bradley, who is young, undefeated, aggressive, hard to look good against, in superb shape, and lacking in star power, probably not what Manny is looking for at this time. And it’s doubtful that aficionado’s will forget what transpired on November 12th 2011. So here we are in a place we didn’t anticipate still trying to process what happening over the weekend. “The show must go on” as they say, and it will, just not the way we expected it. Like life, disappointment is a part of boxing and we move forward even when the luster is lost. Unfortunately, it happened sooner than we hoped, but we’ll make the best of the situation.